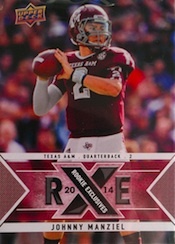 2014 Upper Deck Football delivers some of the first cards of the new rookie crop. 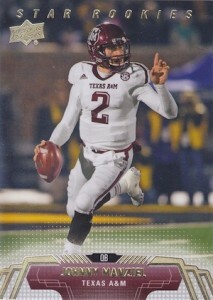 The college release includes a trio autographs per hobby box and the return of interactive Predictor inserts. 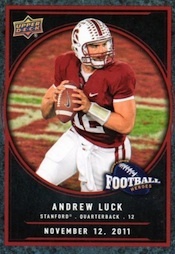 Depending on how far you want to delve, the 2014 Upper Deck Football base set can be straightforward or extremely challenging. The main part of the set includes 50 base cards and 100 Star Rookies. From there, things get a little tougher. Star Rookies SP are inserted 1:12 packs and there are 60 of them. The set is rounded out with another 40 Star Rookies Rare that land 1:120 packs each. And if that weren't challenge enough, there are 25 Star Rookie Variations (1:120 packs) that have a different photo. Star Rookies also have autographed versions. Base cards and Star Rookies have a Glossy parallel that's numbered to 10. UD Authentics Rookies are numbered to 575 with two in every box. These also have autographed copies. 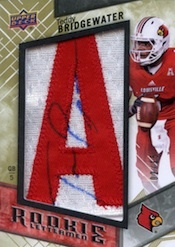 Rookie Lettermen Signatures are the lone autographs in the product that aren't parallels of another part of the set. All are numbered but to varying amounts. 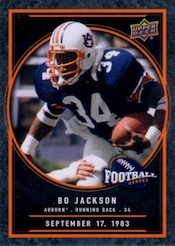 For the past couple of years, College Mascot Patch cards have been among the most popular inserts in the company's flagship football set. 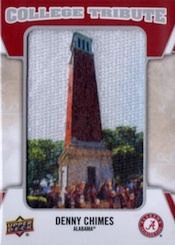 The manufactured patch concept remains, but it has evolved into College Tribute Patch Cards. These use patches to showcase college football traditions from across the country. At least four of the patch cards are included in every hobby case. College Football Heroes inserts focus on standouts from the 1970s and 1980s. Two are in every box with 12 in the set. The set also has autographed parallels. 2014 Upper Deck Football jumps back 20 with1994 UD Tribute.Veterans land two per box while Star Rookies are inserted 1:6 packs. These also have autographed parallels. Sticking with the 1990's theme is the return of Predictors. 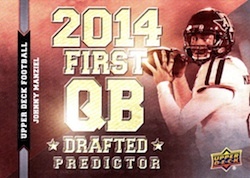 These interactive inserts offer collectors exclusive cards if the featured player is the first picked at their position in the 2014 NFL Draft. 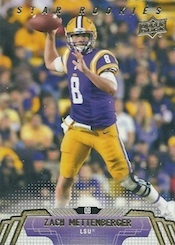 Quarterback, running back and wide receiver cards are each inserted 1:440 packs. Predictors are a hobby exclusive. 2014 Upper Deck Conference Greats #96 Mike Evans Rookie Buccaneers 9.5 GEM MINT! 60 cards. Click here for a detailed guide and gallery. Good: Attractive base set, lots of extras, good mix of veterans and 2014 rookies. Bad: Base set is too small, missing a couple of bigger-name prospects, too much focus on manufactured letter autographs. The Bottom Line: It’s not an NFL set. So what? 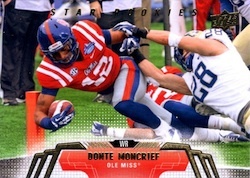 Upper Deck has done a great job at creating something with the NCAA unlike anyone else did before. For me, the flagship Upper Deck set has always started with the base set. 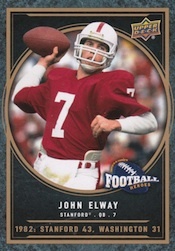 2014 Upper Deck Football is a throwback to that. The base design is excellent, showcasing great photography and clean lines. If only it were a little easier to build. 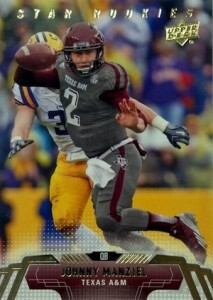 The product also focuses on bolstering box potential with several little extras like the College Tribute patch cards. 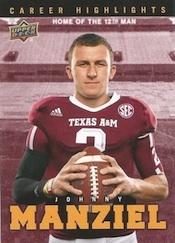 The 2014 Upper Deck Football base set is awesome. Like many of the great flagship Upper Deck sets, it’s about great photography and subtle design elements. While there are some limitations when it comes to older players, rookies and those who went to college in the last couple of decades look fantastic. The additional design elements in the name plate and subtle foil are a nice compliment (even if the nit-picky side of me would have preferred silver foil over the gold that was used). And while these aren’t the thickest premium cards, there’s still a nice slick feel to them. One element of the set I’m not a fan of is the Rookie Lettermen Autographs. The concept of using a manufactured letter patch as an autograph canvas has been used by several companies for some time now. The letters leave little room for the signature. Also, the material limits both the flow and how well they show up. If Upper Deck is going to continue to go this route, I’d like to see them use an acetate overlay for the autograph to separate it from the letter. Or just let the concept disappear. Going in the opposite direction of the squished Lettermen are the very nice UD Authentics Rookies inserts. These have lots of white space that makes the selective foil background pop nicely. The thicker card stock and numbering further add to the nicest inserts in the product (at least the ones that are somewhat readily available). To me, a flagship set like this should have a base set that can be built. Adding some challenge is fine, but too many short prints can work against this. And that’s exactly what happens here. The short set has just 50 cards. Then there are 100 rookies that are reasonable at two per pack. Then things get nutty. There are another 125 cards that are much tougher to find. And these are spread over three more tiers. Sure, one could ignore them, but that’s not the traditional set builder mentality. This is one area that needs some major simplifying. I understand Upper Deck’s desire to add value with the short prints but this takes things way too far. The set has most of the big names of the 2014 NFL Draft like Johnny Manziel, Blake Bortles and Teddy Bridgewater, but their insistence on using offensive players meant that top pick Jadeveon Clowney is absent from the autograph. So is quarterback AJ McCarron, although his stock has fallen. But it’s tough to complain about this too much when there’s the possibility of finding signatures from Joe Namath, Joe Montana, Steve Young and Dan Marino. Flagship Upper Deck isn’t as cheap as it used to be. But neither are bread and gas. It has always been more of a premium product than other flagship sets both in price and quality. You get that sense here. You’re guaranteed three autographs per hobby box. I ended up with a fourth. Granted, none were premium players, but it hit what was expected and went beyond. 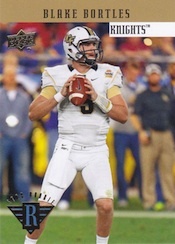 Other things like the College Tribute patch cards are more added value if you get one. This won’t be the case with every box, but it’s a solid way of finishing a break and not feeling like you just wasted your money. As stated, I’d like to see more emphasis on a build able base set. Yes, the super short prints carry some value, but it’s also a turnoff for a more widespread group of set builders. These multiple tiers seem more appropriate for something like SP Authentic instead. Because it’s largely focused on rookies, the long-term outlook for the set is largely dependent on how they pan out. However, Upper Deck has squeezed some good veteran content in here. Also, because the cards are about college, a player who did good at school but flops in the NFL will still carry some intrigue. There’s a lot to be said about a beautiful base set. 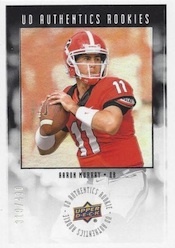 That’s what grabbed me more about 2014 Upper Deck Football. It gives something you can pour over and dig through. It prolongs the experience. Overall, this set gives good balance of something fairly simple while still adding some intrigue with big-name signatures from new and not-so-new players. Click here to check out some of the highlights from the box we busted on Facebook. Perfect timing while we wait for the draft and Press Pass cards begin to fizzle out…can’t wait to grab some SP rookies!!! Still on for 4/16 ? which college patched are more limited tier 1 2 3 or 4 ?????? michael � Haven’t seen the odds yet, but given the composition and past, I’d guess the last cards may be the toughest. Looking at the potential 2014 draft class players depicted on cards, I see nothing but an aggressive strong market for this product on the secondary market. As weak as the 2013 collecting year has been, this is a very refreshing start and a great beginning for collectors this year. As a litmus test, a purchase of a retail blaster box was needed. In my humble opinion, the real meat and potatoes to any set is the base cards. Upper Deck has made an impression this year with this fact. Great simple graphics borrowed from their iconic past products, make these cards stand out. With the inserts, SP, Bo Jackson FH set, Andrew Luck, and much more for a great chase, I feel this year will definitely make up for last years disappointment. I don’t see 2014 overshadowing the Magnus 2012 collecting season, but it will be right on it’s tails. It appears that the Authentics Rookie Signature Set Checklist UD Authentics Rookie Signature Set Checklist is not serial numbered. Bought some loose hobby packs, pulled a Derek Carr, noticed no serial number. Looked at some others on eBay and confirmed none of the autographed authentics have a serial number. Any idea what the print run on the autos is? any ideas why a star rookie says estrella novato on it? I think there’s one that’s in Spanish because of where the player is from but that is all. 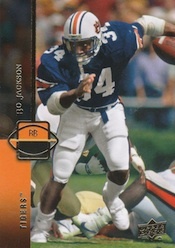 Any word on the none serial numbered authentic rookies? By the way. This is a great product. Just stick to hobby packs and boxes. You’ll be pleased. I picked-up a single box of this product from my LHS and was very pleased. Given the paucity of impact players from ’13, the 2014 draft class is already a boon for collectors and speculators. 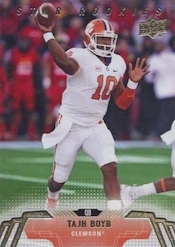 Although I prefer RCs to have the athletes pictured in pro Uni’s, I pulled 5… count ’em 5, autos from my box and therefore I’m willing to overlook the college jerseys. The autos I pulled include Shaquelle Evans (Auto letter /75), Xavier Su’a Filo, Terrance West and 2 others. The SPs are a nice inclusion in the product, and overall… especially given the depth of the class, 2014 UD Football is a fun and inexpensive break that offers a nice return on the dollar. Cards 151-250 are all 1:12, unless I got a hot case. I am not as big on manufactured patches and letterman cards as some, so that dings this set for me some. VERY limited checklist, alot of first round players and top talents missing with many undrafted level players printed. That is my biggest complaint. Strong design, good hits, good price, but I don’t like that checklist. Buy back an NFL Liscense. 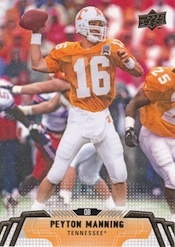 My god I can’t be alone in missing UD SP Authentic True RPA’s in the rookie’s real NFL uniform. I miss those so much, I don’t argue the fact that UD can make some amazingly nice cards, I’m just tired of the college uni’s and all the players that don’t even make a team every year. Amazing Product…First time I ever bought Upper Deck and I hit the Auto rookie set redemption, Just got them in the mail today and there all #ed 8/10. Now I have to figure out what I’m gonna do with them? Thanks man definitely hit the jackpot with this!!! I like thge fact that there are so many more rookies in this collection than the limited # of them in Sage or Press Pass sets. I do have a card # 36 of Davante Adams that says its a 2014 Upper Deck Star Rookie card, but I can’t find it on this checklist. Thoughts as to what collection it is from? Green Bay Jack � It could be from a Star Rookie box set that UD put out for retail. They never released any info on it though and I haven’t seen any in my neck of the woods to know much about it.